“In a time of great divisions across our country and beyond, this week highlights the importance of dialogue and learning other people’s stories, leading to greater compassion and understanding,” said Anastacia McDermott, director of spiritual life and peace and justice and a graduate of Loras. Also featured is Ben Darr, Ph.D., associate professor of politics at Loras, who will present “War, Peace, and Superhero Culture” at 7 p.m., Tuesday, Sept. 25 in Ballroom A in the ACC. Darr teaches courses on comparative politics and world politics with keen insights into the global economy, nationalism and China studies. Throughout the week, Loras will display a historic poster exhibit in the ACC Concourse that commemorates the 70th anniversary of the Universal Declaration of Human Rights. The posters were drawn for a 1949 UNESCO filmstrip developed to spark interest in human rights. Additional images come from international graphic artists depicting a specific article or the declaration as a whole. Hike to Help Refugees: Noon to 2 p.m., Wednesday, Sept. 19. Hikers should meet at the Peace Pole outside Christ the King Chapel. Suggested $10 donation for students, $20 for adults. Learn more about the Rev. Ray Herman: 7:30 p.m. in the Spiritual Life Office, Room 460, ACC. Herman is the inspiration of the Father Ray Peace and Justice Center and the house at the corner of Belmont Street and Loras Boulevard where four students strive to live in an intentional community. 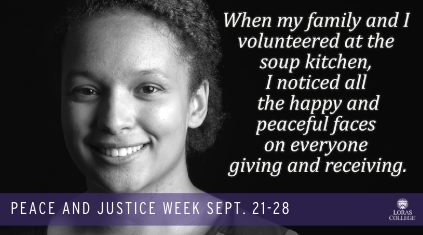 The Center hosts weekly meetings to discuss social justice issues, raise global and local social justice awareness, advocate for peace, and sponsor service and charity fundraisers. The Rev. William Francis Cook (aka Father Emil) will speak about “Asociación Pueblo Franciscano de Muchachos y Muchachas,” which translates as Association of Franciscan Boys Towns and Girls Towns. The presentation begins at 7 p.m. on Wednesday, Sept. 26 in the Spiritual Life Office, Room 460, ACC. APUFRAM has educated more than 30,000 young people in Honduras who are now helping their communities in various fields such as agriculture, business, engineering, law, medicine and education. Nonviolent Communication Workshop: 6 p.m., Friday, Sept. 28 in the Intercultural Programs Office, Room 563, ACC. Sergio Perez, director of Intercultural Programs and First Generation Scholars, will speak on Dr. Martin Luther King Jr.’s six principles of nonviolence.